Assembly carrier is fabricated in a highly automated process. Toho Tenax Europe GmbH has deployed its Part via Preform (PvP) technology for the first time in a commercial environment. The process is being utilized to manufacture the assembly carrier for the Porsche GT3 Cup II racing car. The assembly carrier is produced based on a preform made with random fiber spraying, substituting woven fabric preforms. A carbon fiber treated with binder is sprayed, consolidated and trimmed automatically by a robotic system developed at Toho Tenax Europe. Compared to the current state of the art process – to use fabric based on carbon fiber being draped manually in the mold – the Tenax PvP process produces preforms automatically without internal cuts and draping effects. The homogenous PvP preform reportedly leads to a perfect load behavior of the part. At the same time, costs are significantly reduced due to the automation of the whole preforming process, providing reduced intermediate steps and adopted quality assurance efforts. Injection is via a high-pressure resin transfer molding (HP-RTM) technology that incorporates an in-mold coating step, delivering easy-to-paint surfaces with high quality. Production takes place at Heinsberg in Germany. 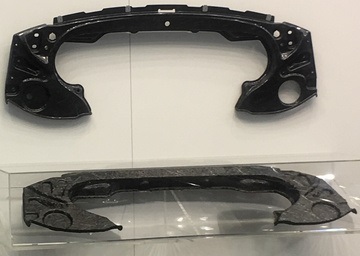 Within the global Teijin Group, Toho Tenax is expanding its composites businesses by integrating advanced composite technologies to form a dedicated Teijin composites business unit.